A 37-year-old man has been arrested in connection with the incident in Coupar Angus. An eight-year-old girl remains in hospital with serious injuries after an attack at a property which left a young boy dead. The ten-year-old died at the house in Union Street, Coupar Angus on Sunday. The schoolgirl was taken to Ninewells Hospital in Dundee, where police believe she will be kept "for some time" due to the severity of her injuries. Scene: Police will put additional patrols in place. Officers arrived at the scene at around 2.30am on Sunday after receiving a call from a member of the public. An injured man was found nearby. A 37-year-old male has been arrested in connection with the incident. 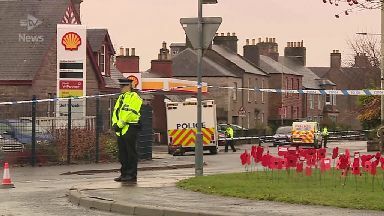 A Police Scotland spokesman said: "At this time, our thoughts are very much with the family and friends of the young boy who has died in this incident and with the young girl who remains in a serious condition in hospital. "I can confirm that a 37-year-old man has been arrested in connection with this incident. "Inquiries are ongoing, however, I believe this to have been an isolated and contained incident with no threat to the wider public." 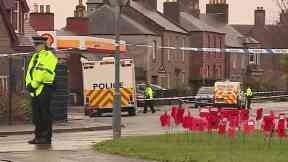 Police confirmed additional patrols will be put in place to provide "reassurance to the community".